Sadly I awoke this morning to the news Mount Sinabung in Northern Sumatra, Indonesia had claimed the lives of three farmers working in the fields by the Gembar Village. This figure has since risen to 7 and is feared to continue to rise with several more critically injured and the Red Cross and army looking for further victims. Mount Sinabung has been in a near constant state of eruption since late 2013. Pyroclastic flows sweep down its flanks on a regular basis which has lead to 4 km exclusion zone being enforced around the summit. On February 1st 2014 people were killed by one such pyroclastic flows. About 10,000 people have been displaced by activity at the volcano which has been on the highest state of alert for well over a year. Sadly the volcano is positioned in a relatively poor and over populated area of the world, many people have little choice but to continue to farm on the volcanoes fertile flanks. Officials have struggled to keep the people to stick the ‘red’ exclusion zones and it is unclear how many people were on the mountain at the time of the recent activity. Head of the National Disaster Mitigation Agency (BNPB) Willem Rampangilei has instructed Karo Regent to take quick measures to vacate the red zones (Gamber village, Simpang Empat district and Karo Regency) but they know that this is easier said then done. The pyroclastic flows caused by partial collapses of the growing lava dome occurred in a series at 14:28, 15:08 and 16:39 local time on Saturday. Rescue attempts went through the night and in to Sunday morning. An ash column remained for hours, towering over the area darkening the skys and hampering the search operation. The pyroclastic flow captured here to the left happened only a week ago on May 16th showing the power and regularity of such activity. On May 9th a lahar swept through Kutambaru near the Lau Barus River killing 1 and leaving one person still missing now also presumed dead. Sinabung lay silently for nearly 400 year until springing back to life back in 2010. It has now killed at least 25 people since its rousing. Volcanism on the island of Sumatra is caused by the subduction of the Indo-Australian plate beneath the Eurasian plate along the Sunda Arc which creates the andesitic-dacitic composition magmas which are prone to such explosive activity. Sinabung sits just 25 miles north-east of the Toba Super Volcano caused by the same tectonic motion. Figures 1 and 2; posted to Facebook by SkyAlert. It has often been pointed out that the deadliest volcano is the one you did not know about. This is our dilemma. When you try to identify the potentially most dangerous ones, by necessity you have to go out on a limb to find those that are not well known nor well studied and there is always the chance to end up with egg on your face. But in this we are not alone. As an example, it was long thought that a particularly heavy layer of volcanic dust in ice core samples dated to c. 3650 BP belonged to Thera. Only recently has most of this been identified as belonging to the far larger, contemporaneous, 100km3 DRE Aniakchak eruption in the Aleutians, Alaska. When it comes to large volcanic eruptions, one of the more striking features is the Sunda Arc that runs from Sumatra via Java and the Sunda Strait through the Lesser Sunda Islands. 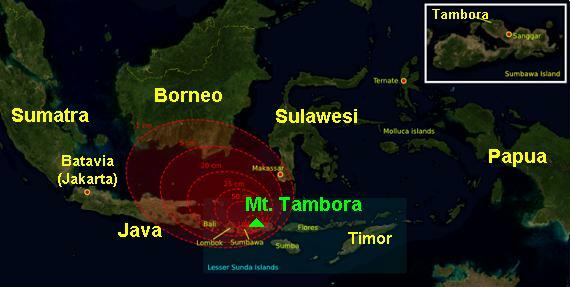 Sumatra is home to the Toba caldera, source and result of the largest volcanic eruption in the past 100 kA. Recently, a vast body of magma underlying Java was discovered, one that feeds that islands prodigious volcanic activity. 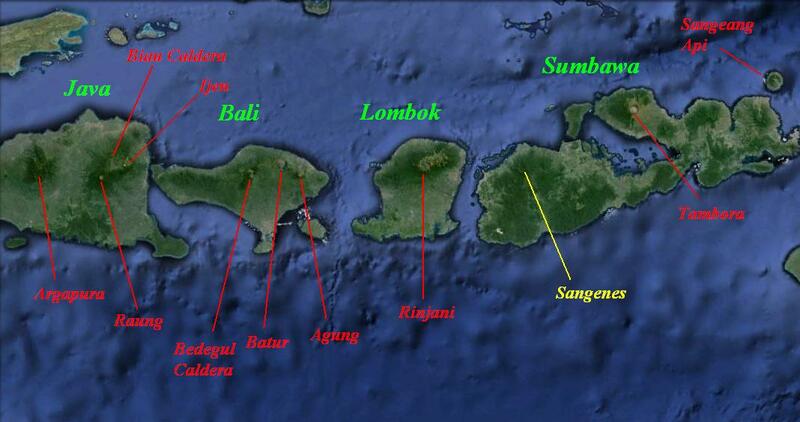 But of the southern part of this arc; the Sunda Strait and the Lesser Sunda Islands, little is known. Yet this part of the Sunda Arc is home to two of the largest volcanic eruptions of the past 1,000 years; Rinjani (~1257 AD, <80 km3 DRE) and Tambora (1815, 33 – 41 km3 DRE). Sufficient to say, was there a repeat of either of those eruptions today, the islands hosting these giants are home to some 4½ million people each and neither such VEI 7 blast would be survivable. As both had “mega colossal” eruptions recently geologically speaking, neither is a good candidate for another one in the foreseeable future. But on the premise that a similar magmatic feed into a similar geological setting will most likely result in similar volcanic activity, let’s take a closer look! Lightning did after all strike twice here within the past millennium! From a birds-eye view, this area is characterised by the formation of very large stratovolcanic cones with a prominence in excess of 3 km (eg Raung, ancestral Catur, Ancestral Batur. Agung, Rinjani, Tambora and the partly submarine Sangeang Api), volcanic complexes (eg. Biau, Buyan-Bratan and Batur) and 10-15 km calderas (eg. Biau, Bedegul, Batur). 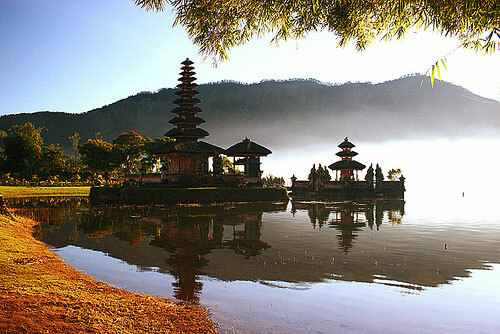 It all comes together on Bali, tropical island paradise and the place to go for a romantic holiday. 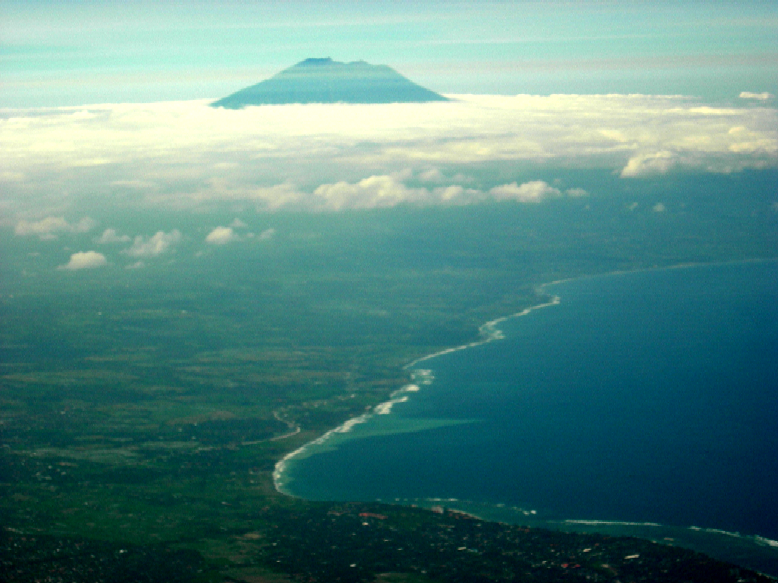 Apart from the 1963 VEI 5 (5.3) eruption of Gunung Agung, little is known about the volcanism of Bali. With a population of 4,225,000 as of January 2014, Bali is home to most of Indonesia’s Hindu minority which according to the 2010 Census constituted 84.5% of the island’s population. Just over a quarter of a century ago, the economy was mainly based on agriculture. Before the 2003 terrorist bombings, over 80% of the economy was tourism-related and Bali had become the richest of all Indonesian territories. Annual tourism is in excess of eight million with five being Indonesian and the remaining three international. To crown it all, Bali was host to the 2013 Miss World pageant. 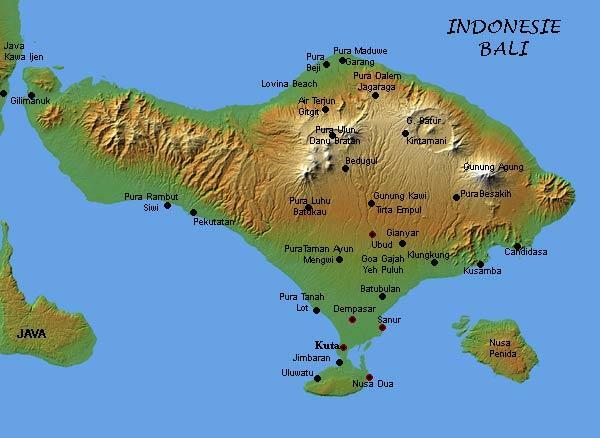 The crust beneath Bali Island is about 18 km thick and has seismic velocities similar to those of oceanic crust (Curray et al, 1977). The depth of the Benioff Zone beneath the Batur Volcano is 165 km, which has been computed by multiple linear regression analyses (Hutchison, 1976). The depth of the seismic zone beneath the arc reaches to approximately 650 km depth between Java and Flores. The oldest widely exposed rocks are lower Tertiary shallow marine sediments, which are intruded and overlain by plutonic and related volcanic rocks in a zone only slightly south of the present-day volcanic arc (Bemmelen, 1949). The rocks of the Sumatra to Bali sector range from tholeiitic through calc-alkaline to high-K calc-alkaline series. Volcanism in Bali is concentrated to three areas, the Buyan-Bratan volcanic complex which formed roughly 100,000 years ago but holds several young stratovolcanic cones to the SSW, the Batur Caldera which formed <100,000 to 25,000 years ago and has the highly active stratovolcanic cone of Batur. Both areas contain large lakes within the caldera perimeters. Finally, there is Gunung Agung which had a powerful VEI 5 eruption as recently as 1963. However, the eruptive record of Agung extends no further back than to the 1808 VEI 2 eruption and that of Batur to a VEI 2 eruption in 1804. Being located just south of the Equator, the tropical climate and vegetation quickly covers whatever volcanics that have been deposited. This may create a false sense of security. The age of the 6 x 11 km Bedegul caldera which formed when ancestral Mount Catur collapsed is unknown although it must be substantially older than ~30,000 years and possibly even hundreds of thousands of years. The field of young stratovolcanoes to the SW, the Byan-Bratan Volcanic Complex, is heavily vegetated, thus the latest period of activity remains unknown but has been tentatively placed hundreds or thousands of years ago (Wheller, 1986). Two of those stratovolcanoes, Tapak and Lesung must have formed after the last large eruption of the nearby Batur Caldera as they not covered by deposits of its youngest dacitic pumice eruptions. 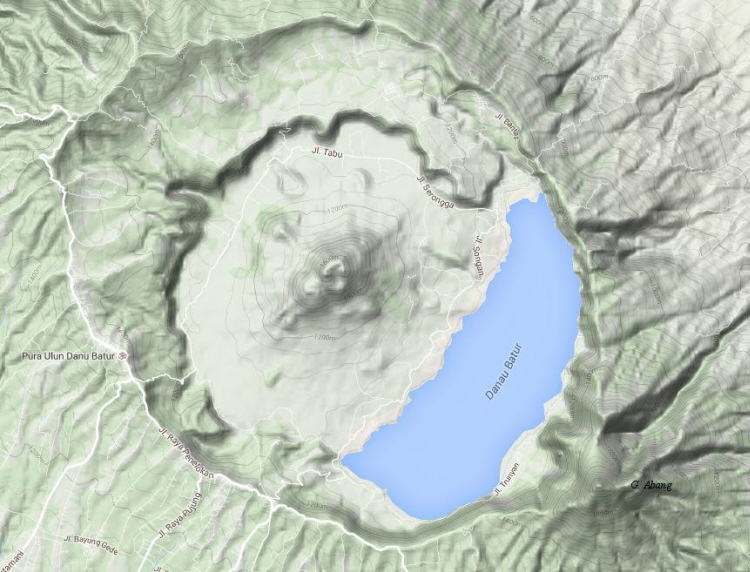 As this has been dated to 20,150 years ago, these stratovolcanoes with prominences of 625 and 669 m respectively as measured from the surface of Lake Beretan must therefore be less than this age. Inside the caldera, geothermal activity is exploited at the Buyan-Bratan geothermal power plant and there are at least a dozen hot springs in the area. The outline of the remaining caldera walls suggest that there may have been two events; the first forming the 9 to 10 km diameter Western part with the stratovolcanic cone of Tapak forming subsequently near the centre, the second forming the smaller 5.5 to 6 km diameter Eastern part. Very tentatively and assuming that the calderas were formed by the subsequent collapse of those edifices following a major eruption, also assuming that the ancestral volcanoes were similarly steep to the nearby Mount Agung, we can make an educated guess at the size of those eruptions. Ancestral Catur (Catur A) would have been about 3,300 m high (a.s.l.) and the caldera bottom, allowing for subsequent infill, would have been about 600 to 800 m deep as measured from the remaining walls. This yields a figure on the order of 52 + 16 = 78 km3 or borderline VEI 7 for the larger caldera, Catur A. Catur B would have been about 2,400 m a.s.l. and the caldera ~500-600m deep as measured from the remaining walls prior to infill. This results in figures of 11.3 + 4.7 = 16 km3 or a small to medium-sized VEI 6 eruption. Please note that this is speculation on my part! No doubt better-informed readers will hasten to correct my assumptions from a position of superior knowledge! 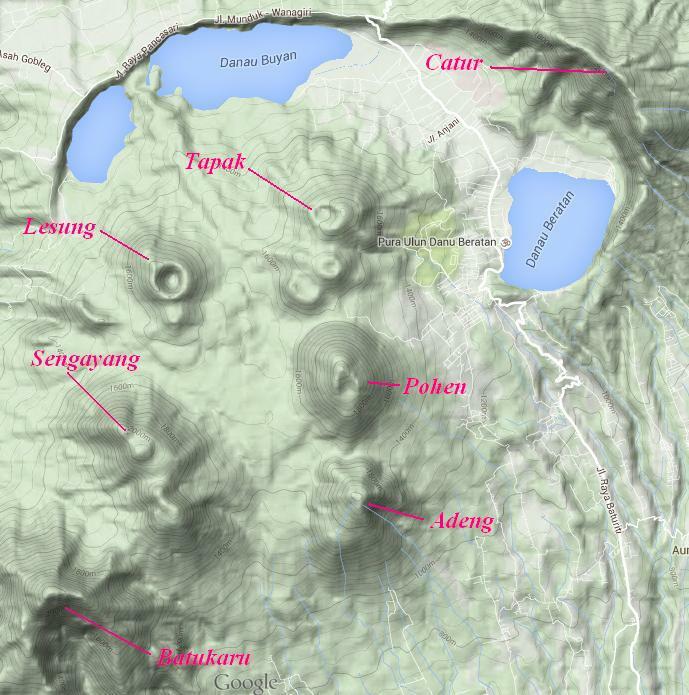 Apart from the already mentioned Gunung Tapak (1909 m), the volcanic field subsequent to the caldera forming event(-s) includes at least another five major stratovolcanoes – Batukaru (2,276 m), Adeng (1,826 m), Pohen (2,063 m), Sengayang (2,087 m), Lesung (1,865 m). There is no information on any eruptive activity but as previously stated, due to the tropical climate and vegetations, all we can definitely state is that there has been no activity in the past two to three hundred years as there is no historical record of any. With at least two of them being younger than ~20,000 years, the likelihood is that all have been active recently, geologically speaking. What their presence does suggest however, is that the original magmatic system of ancestral Catur (Catur A & B) has been well and truly destroyed and that if in the future, there is renewed volcanic activity in the Buyan-Bratan volcanic complex, this will be from one or more of these young stratovolcanoes and most likely not greater than VEI 3, possibly a very small VEI 4 eruption in the sense that the eruption of Eyjafjallajökull in 2010 counts as one. As an example, at Tapak there are at least five layers of scoria separated by four layers of paleosoil, indicative of at least five periods of extended eruptive activity separated by four periods of repose. (Watanabe et al:2010). Watanabe and his co-authors repeatedly lament the fact that while Batur Caldera nowadays is relatively well studied, almost no research whatsoever (apart from their own exploratory field study, author’s note) seems to have been undertaken of the less easily accessible Buyan-Bratan Caldera and volcanic complex. 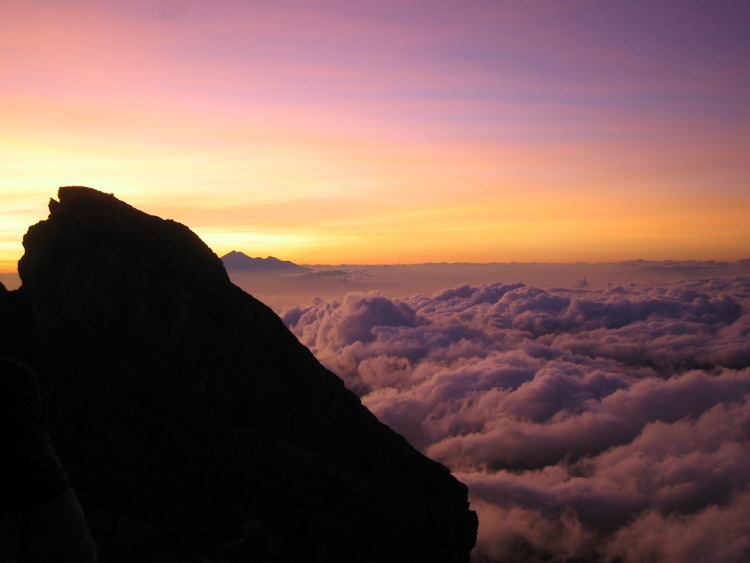 Gunung Batur (1,717 m.a.s.l., prominence 700 m) is a small stratovolcano in north-central Bali and its most active. It has several craters and remains active to this day. The first historically documented eruption of Batur was in 1804 and it has erupted over 20 times in the last two centuries (VEI 1 – 2). Larger eruptions occurred in 1917, 1926 and 1963. 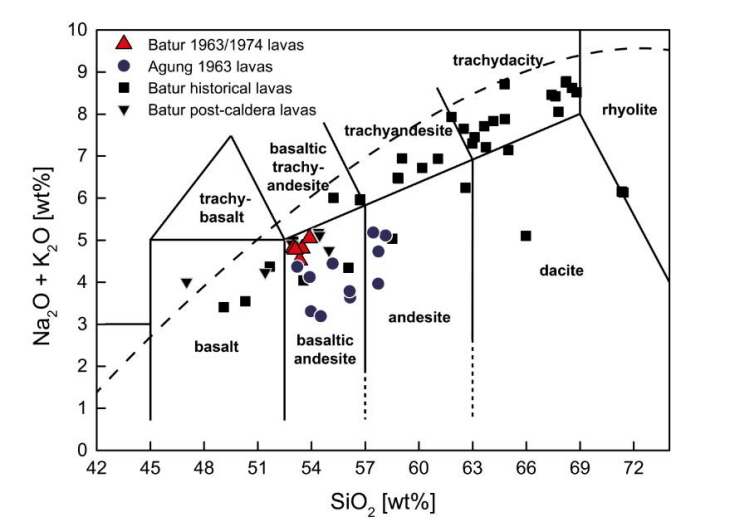 Clinopyroxene from the 1963 eruption of Batur record crystallisation depths between 12 and 18 km, whereas clinopyroxene from the 1974 eruption show a main crystallisation level between 15 and 19 km. Furthermore, plagioclase melt thermobarometry indicates the existence of shallow level magma reservoirs with depths between 2 and 4 km for the 1963 eruption and between 3 and 5 km for the 1974 event (Geiger:2014). This suggests the existence of a very large and rather deeply lying primary or lower magma chamber as well as a moderately substantial upper magma chamber. The term “Batur” often refers to the entire caldera, including Gunung Abang, Bali’s third-highest peak, which is situated along the rim. Batur is a popular trekking mountain among tourists, as its peak is free from forest cover, offers spectacular views and is easily accessible. Batur has produced vents over much of the inner caldera, but a NE-SW fissure system has localized the Batur I, II, and III craters along the summit ridge. Historical eruptions have been characterized by mild-to-moderate explosive activity (Strombolian?) sometimes accompanied by effusive emissions of basaltic lava flows from both summit and flank vents which have reached the caldera floor and the shores of Lake Batur in historical time. 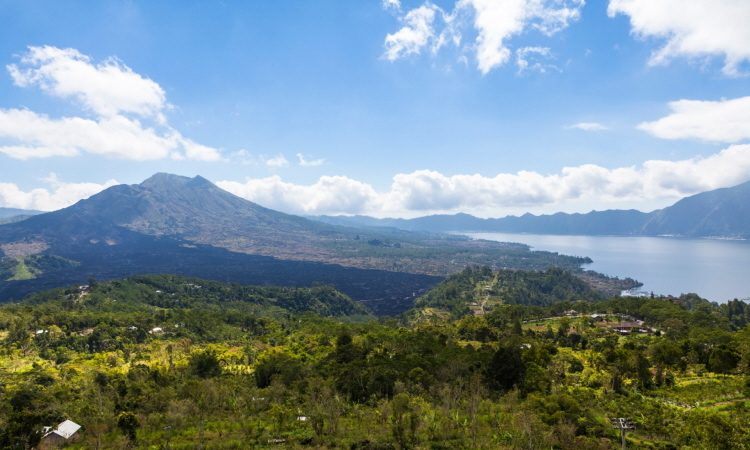 The Batur caldera formed in two stages. Through radiocarbon dating, we have a relatively good idea of when. The first and larger of these is associated with the 84 km3 dacitic ignimbrite known as the “Ubud Ignimbrite” which in locations is over 120 m thick. About 29,300 years BP, Ancestral Batur had a “mega-colossal” VEI 7 eruption which caused a steep-walled depression about 1 km deep and over ten km in diameter. 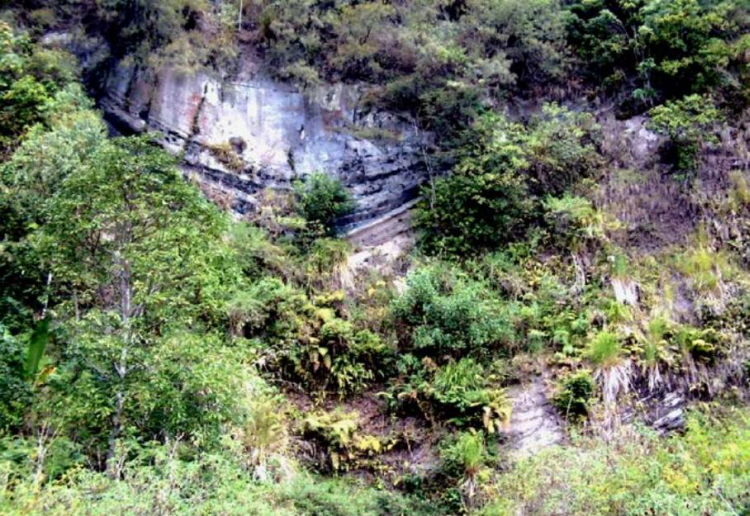 The second ignimbrite, the 19 km3 dacitic “Gunungkawi“ Ignimbrite”, erupted about 20,150 years BP from a large crater in the area of the present-day lake. The second eruption triggered a second collapse, which created the central 7½ km diameter circular caldera, and formed a basin structure. Both the Ubud and Gunungkawi Ignimbrites are of a similar dacitic composition although the latter is more mafic, white to red in main with less than 10% dark grey to black dacitic pumice clasts. In the case of the second of these ignimbrite, two different cooling layers were identified. The lower, thus first ejected, is finely grained and welded, hence it was far hotter. In places, it is between 5 and 20 m thick. The upper, coarser, partially welded and hence “cooler” unit has suffered much erosion but is in places up to between 50 and 70 metres thick. 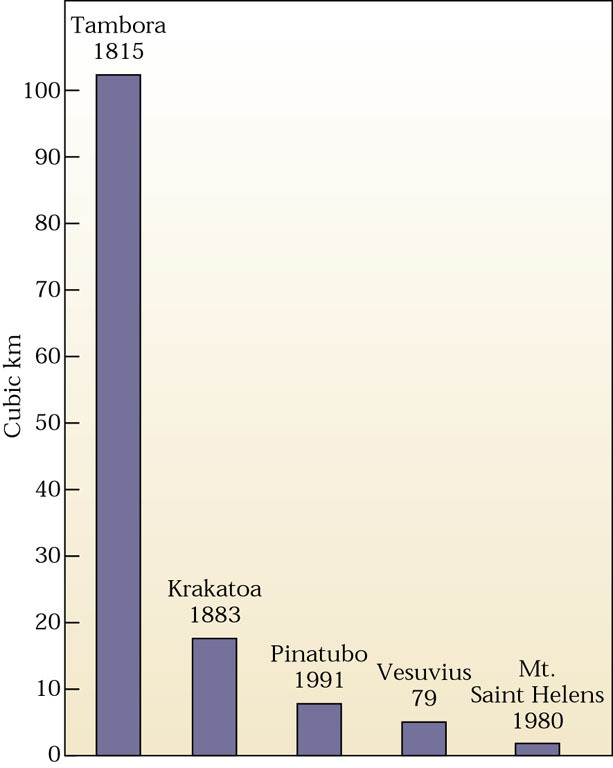 The calculated volume of erupted material for the Ubud (84 km3) and Gunungkawi (19 km3) Ignimbrites coincide with and are proportional to the size of related collapses of Caldera I (80 km3) and Caldera II (18 km3). After these eruptions, there were two further ignimbrite-producing eruptions, both mainly intra-caldera. The Batur Ignimbrite is a densely welded dacitic ignimbrite, typically 50 – 200 m thick, which at one point overflows the caldera rim to form 30 to 70 m thick layers of non-welded ignimbrite. The Blingkang Ignimbrite is a non-welded to moderately welded intra-caldera ignimbrite deposit between 5 to 15 metres thick. Sparse charcoal clasts scattered in this sheet give an age of 5,500 ± 200 years B.P. The thick phreatomagmatic and surge deposits which are found below the ignimbrite indicate that this was preceded by phreatomagmatic eruptions. In addition to these four sequences, basaltic to basaltic andesite lavas and pyroclastic deposits are inter-layered with and underlie the ignimbrite sequences, particularly in the southern slope of the caldera. In spite of the frequently erupting modern Gunung Batur with its moderately sized eruptions, this caldera cannot yet be said to have shot its bolt due to the implied existence of a very large magma reservoir, one that was apparently not destroyed by the caldera-forming eruptions. Both the Batur and Buyan-Bratan calderas illustrate a recurring theme where first a very large stratovolcanic edifice is built after which there is a substantial VEI 7 ignimbrite-forming eruption followed by the formation of a dacitic to andecitic dome complex after which a large, ignimbrite-forming VEI 6 eruption follows. Even if one of these volcanic complexes almost certainly is no longer capable of such large eruptions and the other probably not in the foreseeable future, there remains one gigantic stratovolcano on Bali, one that has dimensions of 8 x 11 km as measured at the 1200-m isoline, 2,000 m above which its somewhat truncated summit towers. 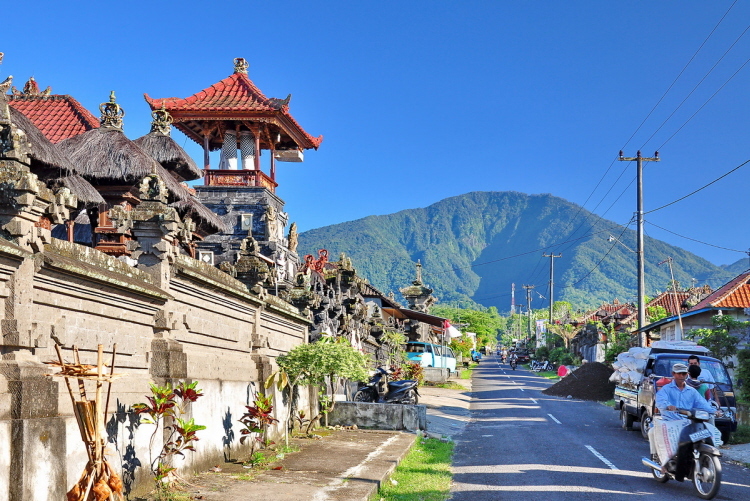 Located in the eastern part of Bali, Mt Agung is a young basaltic to andesitic composite volcano. Bordered to the east by the inactive or extinct volcanic cone Seraja, to the south by an ancient volcanic complex and to the NW by a valley that separates it from the Batur volcanic complex, Agung goes all the way down to the Indian Ocean to the NE and through a long unimpeded decline over the Buyan-Bratan and Batur ignimbrites and lahar deposits to the SW and WSW, all the way to the capital Denpasar and beyond. 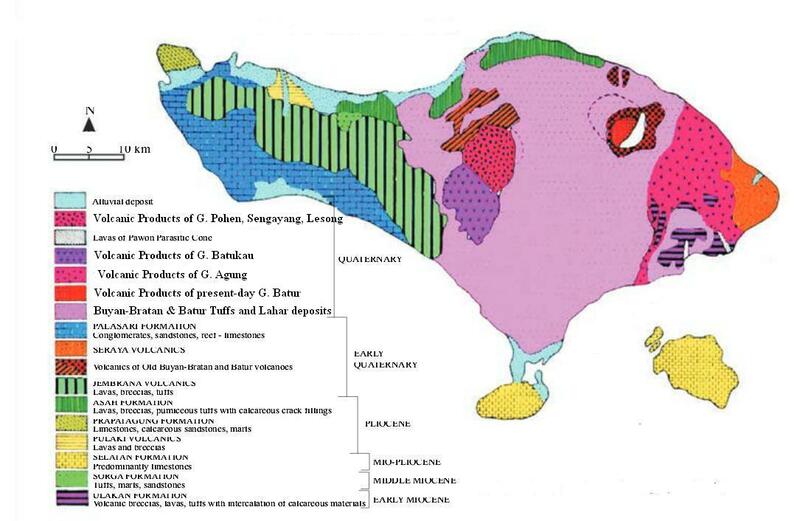 South of Agung, there are older Tertiary volcanic deposits as well as remnants of coral reefs. The present-day volcano is surrounded by older Quarternary andesitic and basaltic-andesitic lavas and pyroclastic deposits, something that has prompted the conclusion that Agung overlies an older caldera formation (S. Self et al:1979). The eruptive record of Agung goes back only to 1808 when the volcano had a VEI 2 eruption. Since that date, Agung erupted again in 1821 (uncertain) and 1843, both VEI 2 eruptions after which it remained dormant for 120 years until the great eruption of 1963. Prior to 1808 is a big unknown, although the relative symmetry of the mountain, the state of its upper slopes as well as a comparison with similar volcanoes suggests that Agung would have erupted relatively frequently. 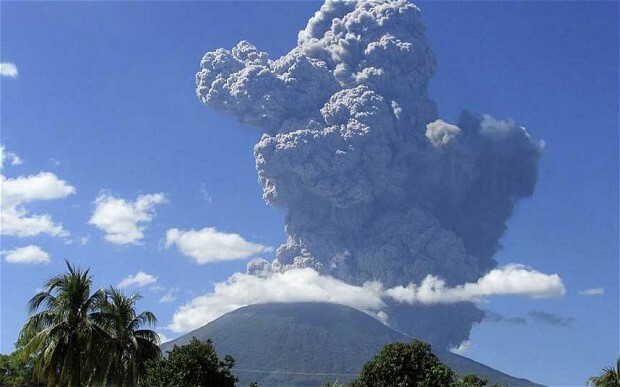 On February 18th 1963, locals reported hearing a loud explosion after which a dark eruption cloud rose over Agung. The first explosions were probably phreatic or phreatomagmatic. On February 24th, highly viscous lava oozed over the northern slope, 0.5-0.8 km wide and 30-40 m in height. It was moving so slowly that it took 18 to 20 days to reach 500 m a.s.l after travelling some 7 km down from the peak. This works out at a speed of about 4 mm per second or 14 m per hour. The volume of lava erupted was estimated to be on the order of 0.05 km3. After this, the eruption continued with a combination of effusive and explosive events. On March 17th came the main eruption. The eruption cloud reached 8-10 km above the volcano but the lower portions fell down the slopes as nuees ardentes that travelled with a speed of about 60 km/hour up to 12-15 km from the crater down the valleys to the south and east. From this description, it seems the eruption was peléean. The pyroclastic flows destroyed many villages around the volcano and caused the deaths of many people living near the river valleys. Estimates are that 820 people were killed by the pyroclastic flows, 163 people were killed by ashfall and volcanic bombs and a further 165 people were killed by lahars. For these reasons, Bali is our proposed number six on the New Decade Volcano program. Acknowledgement: I am indebted to Shérine France for finding and bringing Watanabe et al 2010 and Geiger 2014 to my attention. As I reblogged my last post, a revision of the Decade volcano list by the authors of VolcanoCafe, I thought before I bring you the new list I should really explain what the original one actually was! Figure 1. USGS map of the decade volcanoes. 15 Years on the list is still going all though monitoring in some areas may have slackened slightly. It has seen some success such as the diversion of a lava flow on Etna back in 1992 and has helped form a better understanding of phreatic eruptions on Taal. It has sadly also come at great loss on several occasions as well. 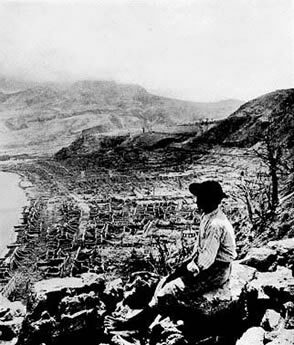 Despite increased monitoring of Unzen in 1991 pyroclastic flows killed 43 including volcanologists Katia and Maurice Krafft and Harry Glicken. And even closer to the project, in 1993 the Decade Volcano conference took place in Pasto, Columbia an expedition from the conference to the Galeras crater occurred on February 14th when the volcano suddenly erupted. 3 tourists and 6 volcanologists including Professor Geoff Brown, Head of Department of Earth Science at the Open University, all lost their lives. Many volcanologist are sceptics and/or critics of the program, hence the call for a revamp. Personally I feel any thing which promotes volcanic awareness is great all though there are some which need much more than others. Volcanoes are ever evolving and unlike most geological features can change in minutes rather than millennia and therefore prehaps a decade is too long for reviews of such a program. I know which have made my list, it will be interesting to see what makes the cut for the guys at VolcanoCafe! Again I must apologise for a lack of posts although there has been a lot occurring in the past few weeks. Sadly life as an Open University student (something I will be writing on shortly), working full-time and having a rather active 7-year-old means my little old website tends to get forgotten about. But enough of my belly aching here of some of the world-wide volcanic updates for the month of May. Friday at 9.59 am local time Mount Shindake on the island of Kuchinoerabu erupted with little warning. The plume scaled over 9 km high and a pyroclastic flow reached as far as the shore. The alert level was rasied to 5 and all 141 people on the island have been evacuated to neighbouring Yakushima island or the mainland and no one has been reported to have been hurt. It is thought that further explosions or more pyroclastic flows are likely as this volcano rarely produces one-off events. When Shindake erupted on August 3rd last year activity lasted for several days. Sods law, I was in Nicaragua only a few months ago and all was relatively quiet. Now both Telica, north of the city of Leon and Concepción on the island of Ometepe have seen small eruptions in the past few weeks. Telica, the more active of the two, hit headlines on May 11th when a group of hikers filmed a small eruption at the summit. The night before a loud explosion was heard but not ash could be seen and it was still deemed safe for people to climb its flanks the next day. I will be honest the video which emerged did annoy me slightly as it is very indicative of todays society; of course when some thing explodes one does not think of their own safety, oh no we get our cameras out and film! It produced about 50 small explosions within the next week or so before several days of apparent calm. It came back to life again on May 27th with a slightly larger eruption which created an ash column just over 3 km high. It is not thought that these explosions are an indication of movement of magma, rather phreatic eruptions. 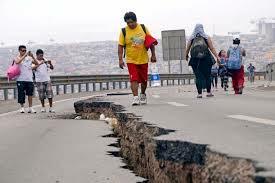 Concepción on the other hand experienced about 60 small explosions on May 8th and several small earthquakes nearby. No ash was record although high gas emissions were recorded. By May 24th there had been 947 small explosions near the summit. Isle Isabella, the Galápagos’ largest island, is also home to its most active volcanoes. Last week Volcan Wolf began erupting with lava flows on its south eatern flank and producing an eruption column almost 15 km high according to the Washington VAAC. Satellite monitoring indicates that to plume is sulphur dioxide rich with little ash, with up to 200 kt of sulphur dioxide being emitted during the first 13hrs of the eruption alone. Media coverage of the eruption has been higher than usual seeing as little threat is posed to the human residants, however the Galapagos islands are rich in wild life found no were else on Earth are being threatened by the situation. A eruption began on May 17th and continued through to May 26th at Piton de la Fournaise, Reunion Island’s most active volcano. Activity and output has decreased on a whole however shows little sign of ending. The alert remains at orange for Calbuco although activity is lower than in recent weeks. Incandescence has still be osbsvered at the crater up until the night of the 26th and small gas and ash plumes tend to be about 300 m abover the summit. 6,685 people are still displaced by the 20 km exclusion zone which remains in place. Mount St Helens, Verusvius, Krakatoa; humanity has witnessed some pretty explosive eruptions that have changed how we view our planet. However these have been nothing compared to the large caldera forming, ignimbrite eruptions or flood basalts of the past. The closest humans have seen to the elusive ‘super eruption’ occurred 200 years ago on the Indonesian island of Sumbawa, and it changed our view on volcanics for all time. Up until the early 1800’s the mountain of Tambora, although towering roughly 14,000 ft over the surrounding area, seemed a rather nonthreatening feature of the landscape. No eruptions for hundreds of years meant few locals even knew it was of volcanic origins. The British East India Company had not long laid claim to many of the Indonesian islands when this began to change around 1812. The foreign residents knew little of the Earth’s more violent activity and even natives paid little attention to an increase in seismicity and small phreatic eruptions and minor ash emissions.This is what made the events which began April 5th 1985 all the more deadly. Figure 1. An artist impression of the eruption on April 5th. Thomas Stanford Raffles was at the time the lieutenant governor of Java. Although of a political position he had a keen scientific mind and brought in zoologists and botanists to the islands as well as making his own observations and recordings. He was, in his own right, one of the first true volcanologists, being the first to scale a volcano using a thermometer to measure differences from base to peak. On April 5th he was over 800 miles away from Tambora when things really began. At just after 7 pm as people settled down in to their evenings Tambora let out and immense roar. Raffles, like many, recorded hearing ‘cannon fire’, troops were even deployed from Djogjokata to seek out potential threat at sea. When ash began to lightly fall by the next morning Raffles sent out parties to find the source of the eruption. 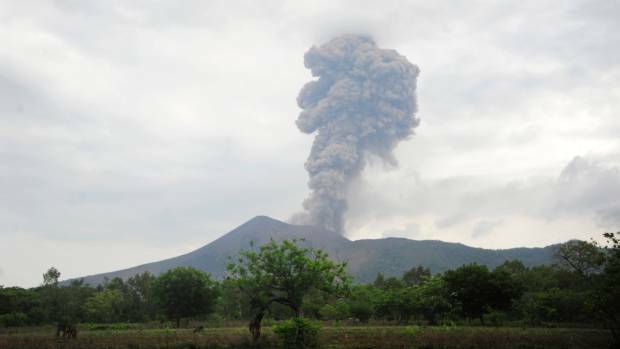 Klut, Merapi or Bromo were thought to be the most likely culprits being highly active and close enough to cover the area in ash, Tambora was not even considered. 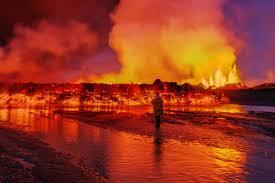 As the days went on and the ash fall waned so did the search and things settled down with the volcano momentarily. The initial eruption only last two hours and ash fall a few days. Sadly this did not last…. It soon became apparent that the eruption on the 5th was purely Tambora clearing her throat and preparing for a much bigger song. On April 10th 3 epic blasts from areas near the summit sent material 40 km in to the sky, meeting to produce a spectacular eruption column. Eventually the three vents caused a huge collapse creating the 6-7 km wide caldera still visible today. Pyroclastic flows sped down the flanks destroying everything in their path. The flux of material pouring in to the Flores sea to the caused a tsunami that rapidly spread through the surrounding waters and islands with waves up to 6ft high. Within 3hrs the sky was invisible for miles, as far as West Java and South Sulawesi. The loud explosions were heard through to the next night showing little sign of easing for over 24hrs. Figure 2. Path of the ash cloud. Most of the red area was in complete darkness while the eruption was persistent and for days after. The eruption did not settle down until April 17th, with the summit completely obscured by an ash cloud untill the 23rd. Explosions although smaller, did not cease untill July 15th, and smoke emissions were still observed as late as August 23rd. Figure 3. Out put of several major eruptions in recent history. Tambora lost at least 2000 ft off its summit equating to it loosing nearly a third of its original height. It is believed to be the only VEI 7 eruption of our time (luckily for us!). The VEI index is a logarithmic scale meaning each level is ten times that of the previous. Based on eruption output the graph in figure 3 shows just how big this eruption was. Thanks to Pompeii, Versuvius’ 79 Ad eruption is probably one of the most famous eruptions but even this killer pales in magnitude compared to Tambora’s might! The explosion was 800 Mt (3.3×1012 MJ), four times the energy of Krakatoa and would make even an atomic bomb look like dropping a pebble in an ocean. Rafts of pumice up to 5 km across caused havoc on shipping lanes and even crossed the Indian ocean washing up on Calcutta 6 months after the eruption began. It is believed at leat 12,000 were directly killed by the eruption through pyroclastic flows. Add to this the tsunamis and devastation to the land which brought famine and disease bringing an estimate of 72,000 – 100,000 fatalities caused by the eruption. Since the eruption, a violent diarrhoea has prevailed in Bima, Dompo, and Sang’ir, which has carried off a great number of people. It is supposed by the natives to have been caused by drinking water which has been impregnated with ashes; and horses have also died, in great numbers, from a similar complaint. But it was not just the local area which was effected by the blasts, Tambora brought on what is famously known as The Year Without a Summer. As well as pyroclastic material the eruption injected a massive amounts of sulphur dioxide and other volatiles not just in to the atmosphere but they were catapulted in to the stratosphere. This caused globe climate chaos for several years. The Northern Hemisphere got the brunt of the bizarre weather such as frost in June and some of the most spectacular coloured sunsets ever recorded. Crops failed world wide and famine was riffe in many areas. It is believed the climate change brought on by Tambora attributed to 90,000 extra deaths over the years after the eruption. Although the weather had many negative effects it inspired many and was indirectly recorded in many notable artist such as Willam Turner and poetry like Lord Byron’s Darkness. Even literature was influenced as Mary Shelly’s backdrop to Frankenstein mirror the climate caused by Tambora. When Krakatoa erupted in 1883 it was the first eruption to make world-wide news as the telegraph made it more accessible. Such technology was not available in 1815 so news of tragedy in Indonesia only travelled as fast as the best ship. Even for people who did know about the events no link was ever made to the weather conditions which plagued the world. Unlike Pompeii’s early discovery pushing it to the limelight, it was only in 2004 that archeologists found remains of villages buried deep under the deposits Although excavation still takes place in the area it is believed they have barely scratched the surface. Figure 4. Finding in 2004 if remains from a village destroyed by a pyroclastic flow. We don’t know if or when Tambora will blow her top again, we don’t know if further eruptions from her or any other of the 150 volcanoes in Indonesia will erupt so violently or even worse. What we do know is that we live on a violent, dynamic planet which is beyond our control. We need to learn from eruptions of the past, and to read precursors to such events to limit their effects on humanity so we have a chance for surviving the next big one. Current Volcanic Activity; New and Updates. 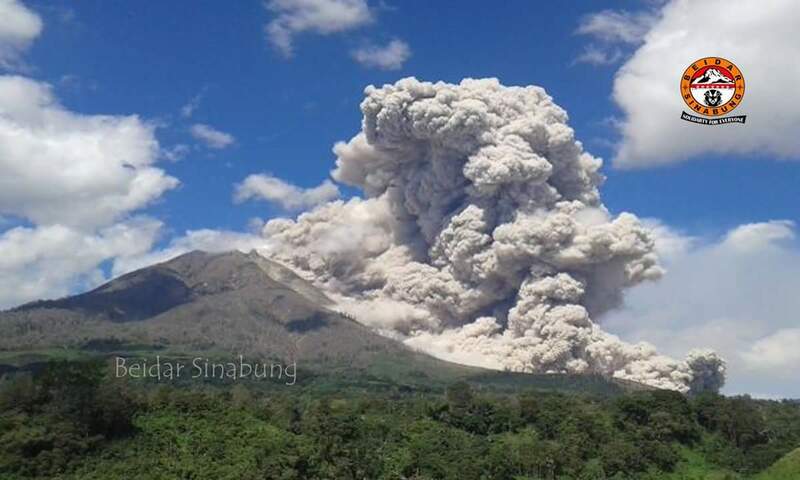 Just moments after posting this originally images came through of a pyroclastic flow at Sinabung at 14.05 GMT. Finally I have found a half decent update from the Global Volcanism Program albeit for about a week or two ago. By the 6th January the lava front had stalled in areas near S Ilheu de Losna where as was still advancing at a slow rate in the northern end of the town. Houses are still being overtake by the flow but decreasing temperatures of the lava means we could be nearing an end to the destruction. For the first few days of the month sulfur dioxide emissions were averaging at 1200 to 1300 tonnes a day. Etna saw out 2014 with some pretty explosive activity on the 29th December. The new southeast crater had consistent but small emissions and incandescents. Explosions intensified on the 2nd and 3rd sending material 150 meters above the crater rim and an ash plume which traveled southwest. Activity has been pretty on going since December 28th and shows little sign of slowing. On January 1st and 2nd, strombolian activity was seen at th Voragine crater, which has been inactive for over two years. Based on pilot observations an ash plume rose to just over 10,000 ft on January 6th. This is the first notable activity at the volcano since 2009. The main caldera is submarine. Darwin VAAC reported that a ‘significant’ eruption began at 14.47 local time on January 6th. A lava flow has travelled 2 km down the WSW flank although no warnings have been issued. An ash plume rose to roughly 27,000 ft how ever nothing can be detected on satellite imagery due to poor weather conditions. The alert remains at 3 on the four point scale. As of January 5th the lava flow now covers an area just over 83 square kilometers. although the overall intensity of both flow and seismicity is less then a few months ago, the fissure eruption shows no sign that it is coming to an end. On December 31st the alert d 2 and local residents were warned not to go within a 1.5 km radius of the crater. White plumes has been drifting from the Ratu crater since late November, but an increase in seismicity and ground deformation has led to the apparent rise in threat. KVERT reported a lot of strong activity at Sheveluch towards the end of December including incandescent avalanches and fumerolic activity. The aviation code was kept at orange as an ash plume travelled both 60 km westwards and over 370 km ENE. 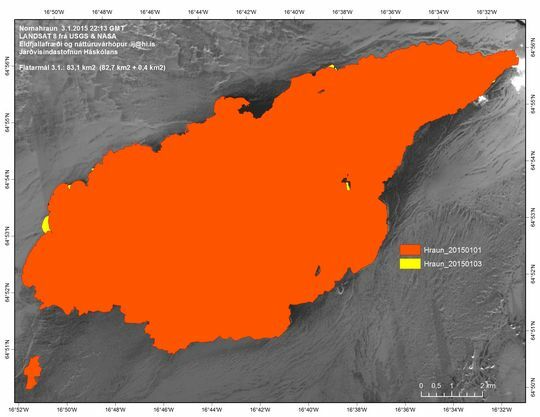 Satellite images indicate a thermal anomaly over a new lava dome on the northern flank.